Scamp travel trailers are great option for people who are looking for small, lightweight campers that can be towed by small vehicles. They are a cute, fun RV option that is also quite practical. 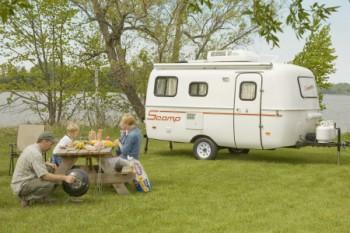 Scamp travel trailers are available in three different sizes. Each size is lightweight and designed for maximum aerodynamic effectiveness. They do not require large tow vehicles, are easy to pull and do not pose the same storage challenges as larger units. One of the smallest available recreational vehicles, the 13-foot Scamp model is a popular with individuals, couples and small families who want to enjoy the fun of camping without the hassle of towing a large RV. Thanks to a wise use of available space, this tiny travel trailer can sleep as many as four people. The unit is outfitted with fiberglass cabinets, an upholstered sofa that transitions to a set of bunk beds, and a dining area that can easily be changed to a double bed. Complete specifications can be viewed on the manufacturer's website. Two standard floor plans are available, as well as two deluxe options. 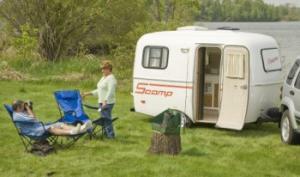 The 16-foot Scamp model offers the convenience of the smaller unit with additional space for greater comfort. Like the 13-foot model, this unit is designed to accommodate up to four people. The extra size translates into additional countertop area and storage space, as well as optional bathroom and shower configurations. There are seven standard floor plans and two deluxe options. The largest of the Scamp units, the 19-foot model is a fifth wheel style. It weighs approximately 2,000 pounds and can sleep as many as six people. There is a queen loft bed above the fifth wheel tongue and the bathroom is between the loft bed and the main camper area allowing for privacy and a quiet sleeping area. You'll need a light duty truck set up for fifth wheel towing for this unit. There is one standard floor plan and two deluxe layouts. 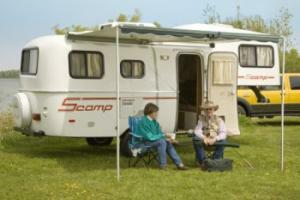 Even though the three sizes of Scamp RVs are small, they aren't sparsely outfitted. RV purchasers can select from among a number of floor plans and interior décor. Each model comes with melamine countertops and fiberglass cabinets with doors made from birch or oak. There are also several upholstery and carpeting options. If you want a small RV that provides a unique combination of quality workmanship and ease of towing, a Scamp might be the best choice for you. If you're considering purchasing one of these units, it's important to be aware that Scamp trailers attract attention wherever they go. Their small size makes them stand out among the other RVs, so you should be prepared to draw notice on the highway as well as in the campgrounds you visit. Many owners choose to join Scamp Owners International (SOI). Formed in 1999 by a small group of Scamp owners, the organization is open to anyone who owns or is interested in Scamp travel trailers or other small, fiberglass RVs. Benefits of membership include a subscription to the quarterly newsletter, the annual membership directory, and annual members-only gatherings at campgrounds throughout the United States. Members can also order Scamp logo merchandise, including sweatshirts and baseball caps.